Do you follow me on instagram? Well if you do then you know we announced to everyone the gender of our sweet baby! We are having a BOY!! We are beyond thrilled! Ever since I found out I was pregnant, I had this gut feeling it was a boy. Of course everyone else thought it was going to be a girl since I was so sick for the first 20 weeks. I have a feeling of relief knowing we will be having a baby boy, because now we can get started on things like planning the nursery (don't you worry I already have it all planned out- even a girls nursery!) and registering for items. We found out during our ultrasound last Wednesday and have been dying to tell everyone. 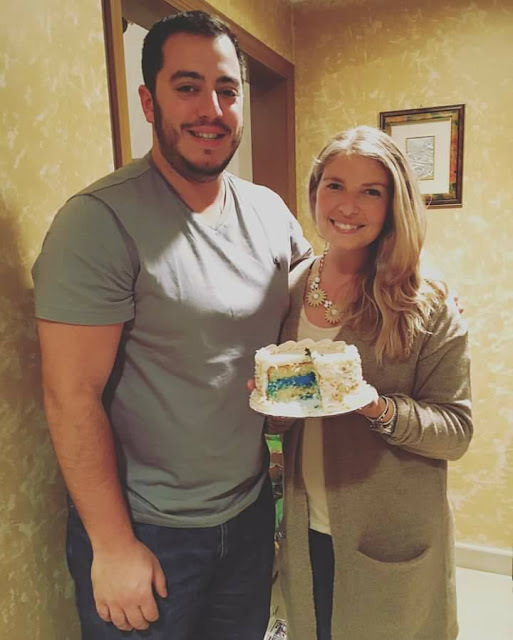 On Thanksgiving we had a cake designed for Joe's family with the baby's gender color inside. It was so fun and everyone was so happy. Now that we have that secret out.. anyone have any advice for baby boys!